Whether this is your first time abroad or you’re an expert globetrotter, it’s always helpful to have a list of items you may want to pack – you know, a comprehensive travel checklist! Save this post because you’ll want to refer back to it as your trip approaches. Whatever your destination, you’ll want luggage that is lightweight and big enough to hold all of your essentials. It’s important to find the perfect bag that is versatile, meets all your needs and is easy to carry. I recommend luggage with 4 wheels – you’ll have to walk long distances at times and it’s a lot more convenient if you can effortlessly roll your bag by your side. Also keep in mind that there’s a possibly you’ll have to lug it up a few flights of stairs. 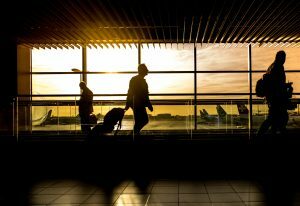 Travel backpack – A lot of the smaller discount airlines, which I’m sure you’ll frequent, have very restrictive bag policies. Traveling with a backpack give you the ultimate versatility on your weekend trips and won’t weigh you down. Purse – be aware of which bags you’re choosing to carry around with you. Pick-pocketing is more common in tourist areas, so it’s important to take this into consideration when you’re selecting which bag you want to be your everyday bag. Something with a zipper is recommend to prevent people from reaching in. I’d advise to never keep valuables in your pants or jacket pockets. Organization is key. Packing cubes or organizers can be helpful if you’re into that sort of thing. If not, I recommend rolling your clothes to save space! Having options doesn’t mean you need to over pack – I advise against it. Pack light and pack smart. Include clothing that can be worn on your daily adventures and then dressed up slightly with a different pair of shoes and some accessories. Maybe a dress that becomes a skirt or comfortable travel pants that can be dressed up for a day at the market. Lightweight clothing that can be layered – I can’t stress this enough. Wool socks – you never know when these will come in handy, but I promise it’s more often than you think. COMFORTABLE WALKING SHOES – the most important thing you’ll pack. You’ll be walking on a lot of cobblestones so those wedges you’ve been thinking about bringing? Forget it. Remember, dresses and sneakers are super ~fashionable~ in Europe. Rain Jacket or umbrella – I recommend a jacket. Sometimes the areas you’re walking in can be quite crowded and it’s a pain to try to navigate with an umbrella when everyone else is attempting to do the same. Dresses and/or skirts – they’re easy to throw on and generally pretty comfortable. Super nice for warmer climates! If you plan on packing toiletries in your carry on, make sure it’s TSA-compliant. Travel bottle such as these are extremely handy for all your weekend trips! I recommend buying any hair supplies such as a curling iron or straightener there. The voltage is different and they will explode – don’t say I didn’t warn you. Shampoo/conditioner – I recommend buying this there unless you use a particular brand. Sunscreen or face lotion with SPF – you’ll be doing a lot of exploring.. take care of your skin! Prescription medication – Check out this blog post about taking your medicine abroad! The next thing you’ll want to do is pack your carry-on bag with anything you’ll want to keep with you on the flight. 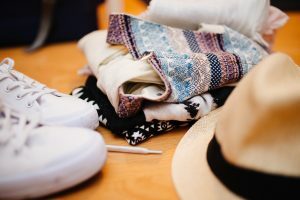 It’s always a good idea to pack an outfit (or two) and a few essential toiletries in your carry-on in case your luggage gets lost. Remember, you’ll be carrying all of this, so keep it light. For a trip where you’re only bringing a carry-on, check out this video! Cell phone and charger – If you plan to get a SIM card there, make sure the phone is FULLY unlocked before going abroad. Books – I recommend e-books; they are way lighter and take up way less space. Chapstick and lotion – it’s dry up there. Water bottle – save space and bring a collapsible water bottle to fill once you get through TSA! Staying organized in this department is the most important. You lose any of these items and you’ll be struggling quite a bit. A wallet such as this or this will keep everything organized and in one place. As soon as you book a trip, it’s a good idea to make sure your passport, IDs, and credit cards aren’t expired, and that they will not expire while you are traveling internationally. I also recommend emailing yourself a copy of your passport, driver’s license, medical cards and itinerary, so you’ll have access to them online at any time. Cash/credit cards – call your card companies before you travel to inform them of your travels. Make sure your cards have a chip. Note that most cards have a foreign transaction fee. I recommend a Charles Schwab debit card – they have no foreign transaction fees and any ATM fees you pay are reinbursed on a monthly basis! Wherever you’re headed, you’re going to have a blast! 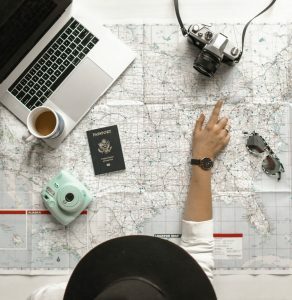 Hope this checklist helped and remember, you are a traveler. Respect the people and places you visit. Immerse yourself in the local culture. Traveling will challenge you in many ways, but it will give you a newfound respect for the world.